The Little Mac Book is a long running series of books which many Mac users, including myself, have been exposed to when first attempting to use the Mac platform. I came across this series when it was in its third edition detailing the Mac OS 7.1 operating system. From then to now the author, Robin Williams, has continued to write this newcomers guide for the Mac. She also co-wrote, along with many other titles, the Mac OS X Lion: Peachpit Learning Series, which takes a deeper look into Mac than The Little Mac Book permits. What I came across in that initial book from 1993 was every piece of information a new user needed to know to get the most out of their Mac. Fast forward to 2011 and the Lion edition of the series delivers the content in the same comprehensive and easy to follow method. Information is relevant and can be applied by users at both entry and medium skill levels. Throughout the book readers will be presented with information which many would regard as common knowledge. Entry level Mac users will appreciate this presentation as it breaks down a common barrier of fear when using technology for the first time. Very few people will seek out the assistance of someone else in order to use their Mac correctly. This Little Mac Book certainly fills that void. Through the author’s skill and passion for the content users will not feel intimidated whilst still exploring many detailed areas of the Mac. If you have ever taken a course at your local Apple Store you will no doubt be aware that you will forget some of the content taught. This book fills that void by being a constant reference to users who require not only additional information but clarification. Chapter 1 eases readers into the world of the Mac operating system. The Desktop, Menu Bar, and Finder windows are all explored. Chapter 2 teaches you how to correctly use your mouse or trackpad along with the new gestures in Lion. Chapter 3 is all about the Dock. How to use it and how to customise it. Chapter 4 explores the world of the Finder and associated areas to assist with everyday navigation and location of files. Chapter 5 takes a detailed look at Menu Bar and keyboard shortcuts. Chapter 6 introduces TextEdit (a built-in text editing application). Areas such as spell checking, cut-and-paste, and special characters are explored in this chapter. Chapter 7 gives you a complete rundown on how to save and print your documents, along with the new autosave feature which has been added into OS X Lion. Chapter 8 instructs the specific differences between closing and quitting an application, along with how to permanently remove files from your Mac by way of the Trash. Chapter 9 gives you all the information you need to know regarding how to get connected to the Internet and set up your email account. Chapter 10 uses Safari as a basis and explains everything from a web address, to bookmarks, to Safari’s built-in reader options. Chapter 11 explains all the important aspects of using Mail, including correct etiquette when writing and sending emails out to multiple users and groups. Chapter 12 in summary form attempts to explore a series of other functions of the Mac including System Preferences, Aliases, Burning A CD or DVD, Mission Control, Spaces, and Exposé. This final chapter could have been more detailed and explored more of the System Preferences especially the area of Security and Privacy. I often come across users who have no idea what security options are available for the Mac, along with how to activate them. Books like this can help users better understand the implications of poor security and protecting your identity and information when traversing and connecting to the Internet. Overall, The Little Mac Book, Lion Edition has been a pleasure to read. Despite being well adept with the Mac platform, I even learnt quite a few things by reading this book. Whilst it is primarily for newcomers to the Mac platform it is sometimes nice to go back to basics. My only disappointment was lack of security information and therefore I am awarding this book a MyMac review rating of 9 out of 10. The little Mac Book for operating system X was is very useful as it is direct and to the point. Some previous operating system books have been so detailed that they are hundreds of pages long and hard to use. 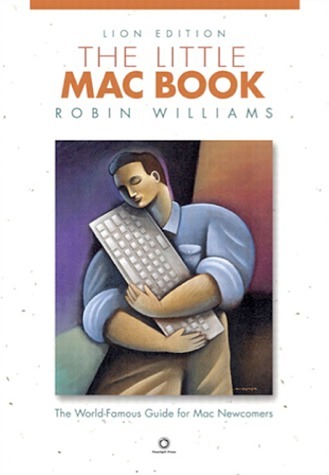 I would recommend Robin Williams book to all who have been overwhelmed by the many changes in Mac computers.